2:30 p.m. Just set 7 eggs in my Mini Advance. 70% of my flock was wiped out yesterday by a stray dog. Gone but not forgotten : barred rock roo, barred rock hen, my crazy duck pen laying BSL, & RSLs. I am left with a very tiny flock- a non laying rehomed silkie cross, 1 white columbian rock, 2 BSLs, 1 RSL and my little frizzie silkie roo. I am used to getting 6-8 eggs a day, so this will be quite the change. I recalibrated the hygrometer- discovered the old salt water mix from last hatch was giving me a strange reading, so I dumped it and mixed up a new batch 1/2 cup salt, 1/2 cup water. Calibrated at 70%, same as last hatch! 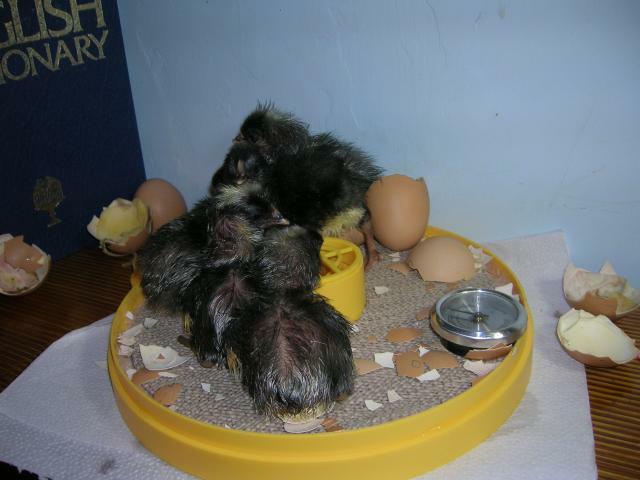 All eggs candled free of cracks and were not as porous as Hatch 1. Average egg weight 66.34 grams. All eggs were left unwashed. As expected, about 20 minutes after loading the Brinsea, the low temperature warning went on. The temperature should soon stabilize and reach 37.5C. I am much more confident with what it is I need to do this time around. 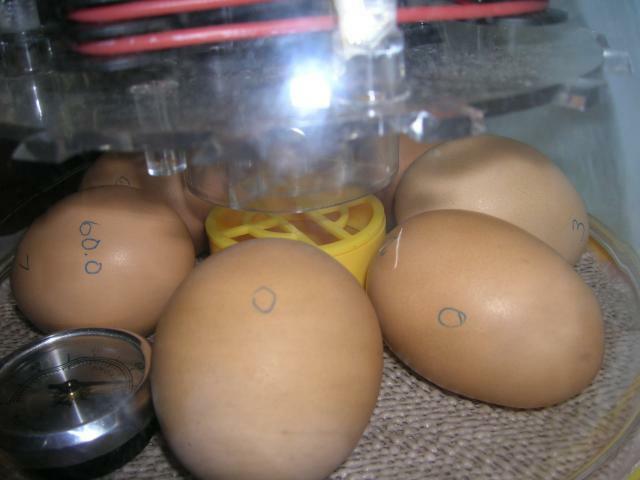 Temp and humidity have been right on target since setting the eggs on Saturday. Organized a March Hatch-a-long for BYC folks. Brinsea is donating an Ovascope. Join the gang by subscribing to https://www.backyardchickens.com/forum/viewtopic.php?id=455378&p=1. Rules are post a pic of your hatch in the Brinsea on BYC and the same Pic on Brinsea on Facebook. Hatch must be between Mar 1 & Mar 31 to be eligible to win the OvaScope. I'm in! 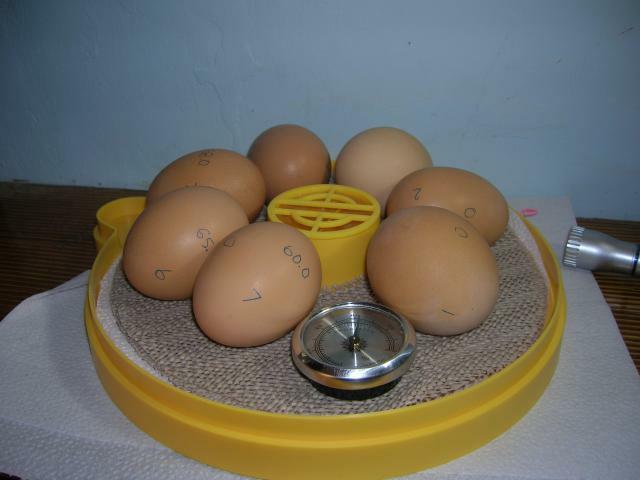 I decided to weigh my eggs daily to keep a good handle on my humidity. So far, we are bang on! 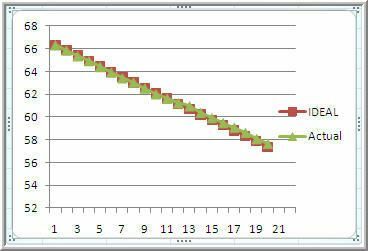 This is how things are looking (red ideal is representative of 13% weight loss desired for chickens. The green is actual weight loss). I have a very fancy spreadsheet for the calculations but I'll spare you the details! Happy 21st birthday to my son! I candled the eggs tonight and am happy to report that I have 7 moving blobs in 7 eggs!!!!!! Happy 23rd birthday dear daughter! 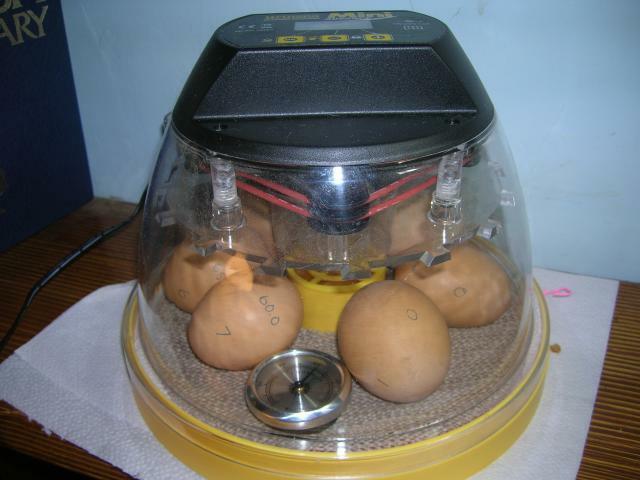 Candled the eggs this evening- all are developing well. Weight loss is bang on and the temp always is extremely steady on the Brinsea. 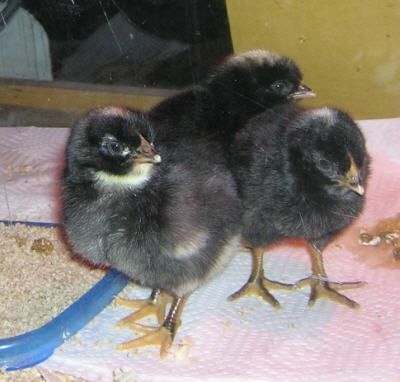 Called the peep who I loaned my brooder and lamp to, and he will return it this weekend plus return half a bag of chick starter- Yeah! Must remember to give him his bottle back that they gave me the great goat's milk in! He says all the chicks have developed well and are now at an ugly feathering stage. I would love to see them! 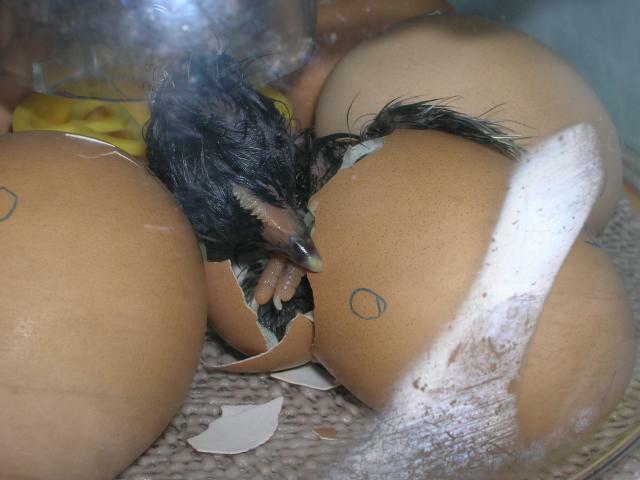 One more week to go till the eggs hatch! My humidity keeps running high due to all the rain, so I am running the bator with no water in it whatsoever. You can see the spike in the chart above. Candled last night and everything looks good. Friend is bringing over wood shavings this morning so I will cover the coop floor with them. Hens are out wandering around in the rain acting like ducks. The ducks are still confined to their pen as the pond is still frozen over. Soon I hope I can let them out and clean out the stink in that pen! 7:00 p.m. Panic time. I weighed my eggs and had a huge drop on my chart! My cat had landed on the keyboard when I had cells open and had added a few grams to the numbers! Found the mistake, corrected it, and everything is just fine and dandy- phew! I have no idea how many eggs I got today. My son collected them, took all the eggs in the fridge to his boss. Geesh, not one egg here! How unbelievable is that? Found my duck pen gate ripped off the hinges when I came home from work tonight. Managed to get it back together, and thank heavens there were no duck losses. But what the heck did that? It would have been sometime during the day, so I'm thinking DOG!!!! I will be soooooo pissed if something gets my ducks. Just a few more days of winter and then the ice will melt off the pond and they will be safe out on the water. On the humidity front, the room that my bator is in has been 65% for the last few days. Even with running the bator with no water, my humidity is obviously too high. I'm still close to the desired weight loss, but off now by .30 g.
Updated my weight chart above. I'm not going to make 13.5% weight loss by tomorrow= more like 13.25%. Candled the eggs and inspected the air cell. It should be a tad bigger but with the high humidities it's still pretty good. Lockdown is tomorrow! I will be removing the egg turner, lining the bottom of the brooder, filling the water wells and placing in the hygrometer. Then I'll start listening for peeps! I have a pip on Egg # 2 when I woke this morning. 10:00 a.m. 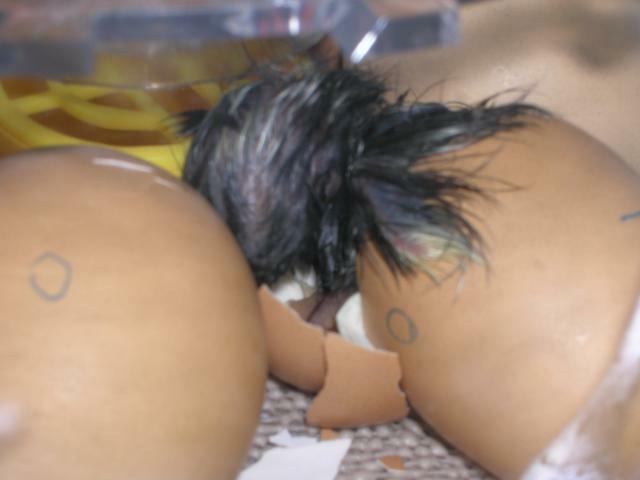 Egg # 6 has now pipped!!!!! So I spent all day at home expecting the first egg to hatch so I could document it for the Brinsea March Hatch-a-long. All 7 eggs had pipped my mid afternoon. 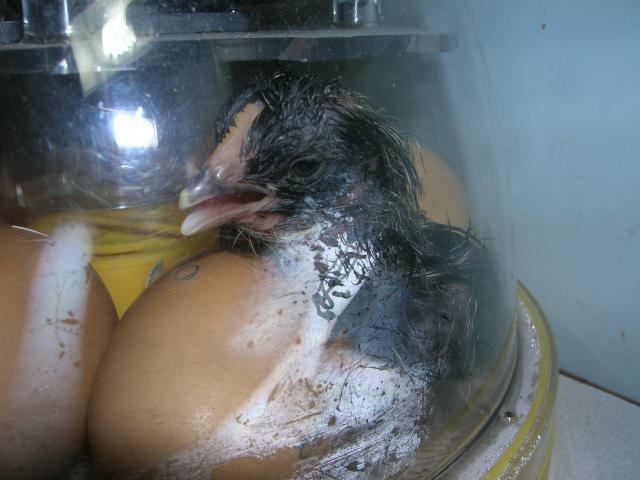 Went to bed at 11:00 p.m. as there was not hatching activity. My weim Zest woke me up at 4:00 a.m. and I went and peaked at the bator- ALL 7 HAD HATCHED !!!!!!!! I took some very foggy pics and staggered back off to bed. 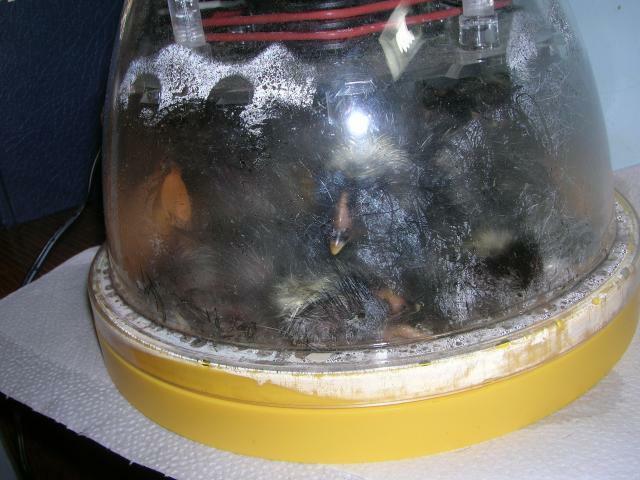 At 8, the chicks looked so crowded in the bator, so I moved them to the brooder and went to look at my pics. 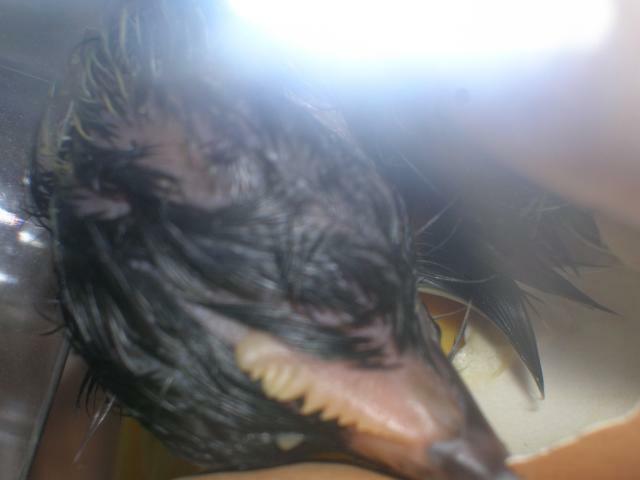 My son is my hero- he was up when #2 egg hatched and documented it!!!!! I have submitted my BYC and Brinsea facebook page pics and am now going to post more pics here. Thank you Brinsea for the 100% hatch. I have fuzzy butts! 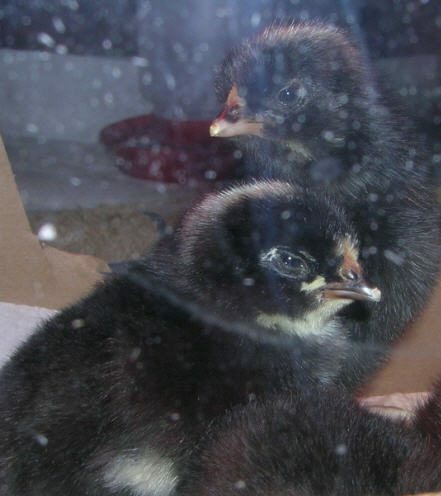 The pics above are courtesy of my kid who was awakened by our dog at 1:00 A.M.
and now we are in the brooder keeping nice and warm. So are we pretty cute or what? 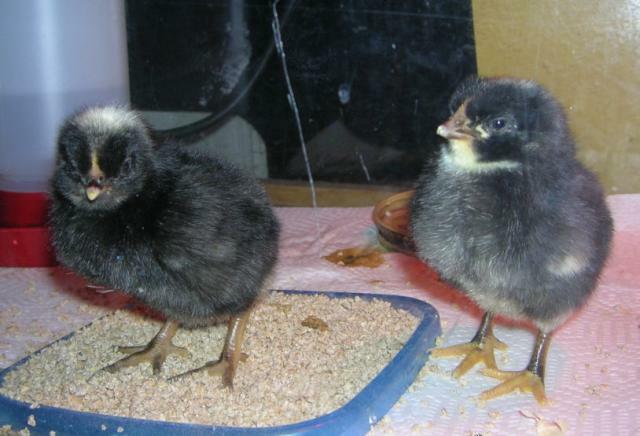 Not sure how those little fluffers did it, but they managed to knock the waterer over and totally soak the floor of the brooder! They were all looking sweet and innocent and dry in their "nest" when I discovered the flood. Thank heavens they were smart enough to seek high ground. Managed to get it all clean and dry and I removed the waterer and gave them a lid with water in it for the night. My kid found a couple of spiders in the bathroom so he decided to throw them in the brooder. Chicks had a ball and caught and ate both spiders within seconds. It was very amusing to watch. Lid was empty of water this morning (not surprised). Cleaned up their poopy mess. Put the waterer back in. Added the feeder. Hope they don't have any disasters today!